Discuss the technical details of an "open source" community-driven design of a polywell reactor. How expensive would it be to convert the fusion products into grid commodity electricity (synced with the grid and everything)? Inverters cost more than $100 per kilowatt (grid synced). Is there a potentially cheaper way to get about 50 kilowatts of whatever voltage DC into something you could feed the grid with? $100/kW comes to just over 1cent/kW-hour if the inverter lasts one year at rated output. The cost of power conversion equipment also varies with scale. What scale is the >$100/kW figure? I also note that electric utilities have started using high voltage DC for very long range electric transmission, more efficient even after conversion than AC. The basic principles are the same on paper, but the practical engineering issues become vastly more difficult when dealing with those types of voltages. prestonbarrows wrote: Fusion products have energies of the order of 10's of megavolts. Actually, the energies per alpha (which are not mono-energetic) are less than 4 or 5 MV for p-11B fusion, but I'm not sure of the exact range. Still a non-trivial engineering problem, even for under 1 MV (see 800 kV conductors below). Direct conversion, I think, is not an issue of several MeV, but possibly several hundred KeV. That is the conversion is a multiple stage process. Each set of electrodes (as the radius increases) are biased several hundred KV each and there may be ~ 10-20 sets/ stages. Each draws off up to several hundred KeV, until finally the fusion charged particle is allowed to ground on ideally the final electrode/ shell with a small fraction of it's initial KE. This decreases the voltage load on each stage and allows for conversion of a range of particle KE within limits. The KE of the alphas is probably ~ 4 MeV, 2.4 MeV and 2.4 Mev (there is some uncertainty - a Tri Alpha study gave different values). Added variation comes from the center of mass KE of the impacting fuel ions. If their net energy is 400 KeV, to the left, but the test alphas flies to the right, the net KE would be 400 KeV less and 400 KeV more if they flew off to the left. If flying up, down, or some other vector the KE of the alphas will vary accordingly. In the ideal situation (never happen) in a Pollywell, with perfect confluence, the vast majority of fusions would occur at the center with near zero net KE of the colliding fuel ions, as measured from the rest/ lab frame of reference. +200 KeV plus - 200 KeV = zero. In this case the alphas would have precise KE as listed above. Theoretically two grids, with the inner at - 2.399 MV and the outer at 1.98 MV would harvest almost all of the KE with only a few thousand KeV left in the alphas as they finally hit a surface. The process is, of course, much more messy and complex than this and direct converting ~ 80% to 90% of the energy with significantly more grids is probably an optimistic goal. The output energies are dependent on the more than the primary reactions. Each machine construct is going to produce a slightly or significantly different energy profile of resultants based on this. I think that the polywell machine remains to be seen in a steady state reaction for what becomes the dominant reaction chains. In any event, it will not require the behometh pictured above. There are several ways to skin the cat for collection. These will be primarily determined by the application IMO. There is also the possibility of slowing things down by magnetic conversion if the output of the Polywell is pulsed. This is not unlikely given the nature of the device. It may also be possible to operate it in a pulsed mode if necessary provided the pulse frequency is high enough - probably on the order of KHz. Several things I'm confused about and several questions and thoughts in here ... so my apologies in advance for your efforts to answer. With direct conversion, I've read (somewhere?) that direct conversion *ideally* would be at most 80% efficient. The 20% that isn't recovered directly presumably ends up as heat. Are these percentages familiar to anyone? Not sure where I took them from (sources?). Clearly some percentage must be lost as x-rays and neutrons in the core. But of this percentage that's lost - how much of it is lost during the DC-AC conversion process and how much is this lost in the reactor itself. One of the questions I'm trying to understand is how we dissipate and very possibly use this heat energy and in particular where is the heat coming from (obviously through-out the system as a whole) but percentage-wise how much from the reactor core and how much from the electrical conversion hardware. I am guessing that the 80% ideal direct power means 20% remains uncaptured that becomes heat in the core. meaning that there is going to be a percentage of loss in the direct conversion process too. So 80% [gross ideally] becomes --> 60-75% [net ideally] and another 5-20% heat (depending on the efficiency of the conversion process - and presumably the cost of the components used in the converter). All of this would mean that we get 60-75% actually electrical output from the 80% ideal unconverted 2+MV DC. which means we would have 20% of heat in the core to deal with plus 5-20% heat from the converter to deal with. depending on the size of the power plant this will be a huge factor to be considered in the mechanical engineering. If we have such a large amount of heat to deal with in the first place, unless we have something useful to do with this heat as opposed to steam production, then it seems steam production is going to be a major component in any case. Given the potential costs of direct conversion (high), then despite the efficiency increases of direct conversion, might it make more economic sense just to go with a larger steam-turbine system? Or to design to plugin-into existing steam turbine systems? Okay, I'm done, tear it apart! Tyler Jordan wrote: Several things I'm confused about and several questions and thoughts in here ... so my apologies in advance for your efforts to answer. Direct conversion is done by collecting the alphas with an electrode that supplies the alpha with two electrons and neutralizes it. The alphas will have a range of energies. So lets discuss collecting a range of energies. For illustration purposes lets say the energies run from 1.8 to 2.2 MEV and the collector electrode is at a voltage that is at 2 MV. What happens to the 1.8 MEV alpha? It doesn't have enough energy to get to the electrode and is repelled by it. What happens to the 2 MEV alpha. It has just enough energy and it reaches the electrode and is neutralized by it. There are no losses. How about the 2.2 MeV alpha? It reaches the electrode but has more than enough energy. The .2 MEV excess is converted to heat. The electrode will need to be cooled. So there will need to be a series of electrodes each with its own conversion system to make either DC for long distance transmission (the high voltages will need to be down converted to the line voltage and the low voltages will need to be up converted). Or the electrodes will all needed to be converted to system HV and then converted to AC for local use. The more electrodes you have the lower the losses and the bigger the reactor vessel. Fewer electrodes gives you higher losses. There will be a sweet spot. That is an engineering/economics question. The electrodes could be gas or water cooled. Depending on the waste heat amounts. Conversion in a thermo plant may be useful. Whether that plant should be a gas turbine or a steam plant is also an engineering/economic question. In a PB system there will be huge amounts of energy lost to X-Rays. The X-Ray energy will need to be dissipated. Again it may or may not be useful to have a thermal plant to collect and convert that energy. Another design decision. X-Rays are converted to heat by mass. So the temperature of a water shield (because it is thick) will be low. A lead shield will have a higher temperature. Can that heat energy be economically converted? More design/economic questions. DC to DC conversion is running 95% to 99% efficient these days. DC to AC conversion is in about the same range. Let us say we are at the low end. Overall conversion efficiency will be 90%. If we can get to the high end we are at 98% efficiency. Again you have a series of engineering/economic choices. A new direct energy conversion technique that uses the angular dependent transmission of ribbon grids, which resemble Venetian blinds, to recover the energy of particles leaking out of a fusion reactor is discussed. This converter works well, even to energies as low as 10 keV, because of its excellent space charge handling ability. This low energy operating range makes direct energy conversion possible on closed confinement devices; operation at about 100 keV might be useful on open confinement devices. Energy recovery efficiencies of 60 to 70 are predicted. 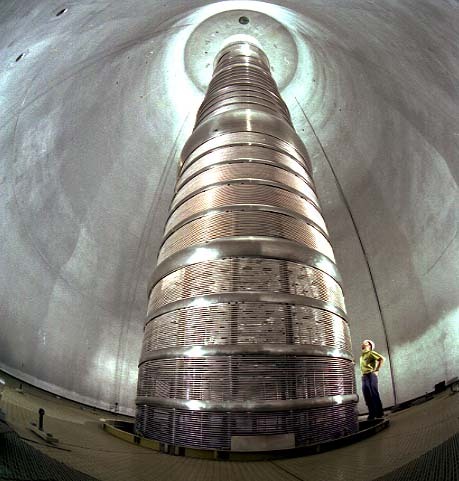 Examples are presented in which a direct energy converter with efficiencies in this range, when viewed as a topping cycle to a thermal converter, could considerably improve the reactor prospects of both open and closed field line confinement schemes. The Venetian blinds designs that I have seen are not for polywell and seem to assume a large spread in alpha trajectories. However for polywell, the ions have very distinct exits at the cusps and should be amenable to directing with electrostatic plates like vacuum tubes use. That would also help reduce the effort to exhaust the reactor fusion alphas/helium gas. What I'm trying to get my head around here is the heat problem, for a plant producing even 10MW, the amount of left-over heat after direct siphoning/conversion of ions is going to be massive and in the a compact polywell reactor and I wonder how this can be dealt with - just to keep various lower-temp parts from becoming slag! Any ME's want to weigh in here? Maybe this has been discussed before somewhere. I'll look around the forum some more. Last edited by Tyler Jordan on Sat Jun 20, 2015 3:20 am, edited 1 time in total. I got 3.2 (out of 4.0) om the ME part of my oral nuke exam. - the highest my examiner gave to non-MEs. So I'll chime in. Water as a heat transfer medium. There are also heat transfer oils. Their heat transfer capacity is lower by about a factor of 4 vs water. But the problems of isolating the HV are easier. A silicon oil would probably be good. Things are considerably eased because you have a series of collectors. All the heat is not coming from one collector. And you do a two loop system. A small volume heat transfer system - oil to the coils - which is cooled by a water system. The really tough one will be the LHe used to cool the SCs. That is because the temperature rise will have to be kept as small as possible because cooling at 4.2K is very expensive - energy and mechanical wise. There are also "tricks" like counter flow heat exchangers to preheat the oil so the temperature delta through the coils is kept low enough to avoid thermal shocking the metal excessively. All this is eased to some extent if you just throw away the waste heat. The delta Ts can be larger. MSimon wrote: All this is eased to some extent if you just throw away the waste heat. The delta Ts can be larger. Being ever-mindful of course of the KISS principle.